In case you’re starting to look for gifts for your family and friends, THE GENTLE WAY books make great gifts! Some of my readers give five to ten books as gifts. What better way to change your friends lives for the better? And have you bought one of these books yourself yet? If not, why not? This should be on your 2012 Resolutions List. On the MBO forum one lady just posted that this is better than the Secret or anything she has ever tried, because IT WORKS! You can buy them online by simply going to my website and clicking on the images on the side (which takes you to Amazon.com), or you can call my publisher direct at 800-450-0985. Subscribing to this blog is easy, just go to http://www.gentlewaybook.com/blog/?feed=rss2 . I also email a weekly newsletter with more advanced topics, which you can subscribe to by going to http://TheGentleWayBook.com . Here you can also read a couple of sample chapters of my first book to give you more suggestions on requesting MBO’s. Please forward this blog to your friends if you enjoy reading it. In the Articles & News section I have a new Search Function you can use to search all my articles and newsletters by simply entering a word or phrase. And be sure to request to be my Friend on Facebook. I give extra information during the week there. This was in yesterday’s newsletter, but I thought it important enough to share with you today in the blog. This demonstrates exactly how to use Benevolent Prayers for something you might feel helpless to be able to assist, but saying the BP below will add your “energy” to this and make this much more powerful than you can imagine. So be sure and say the BP OUT LOUD and then take some practical steps to create this reality. Thank you! As anyone knows from reading this newsletter for the last three years or so, I really try and stay nonpolitical. If Theo or Gaia says something is going to happen, then I report it. But this comes under the heading of previously received information about whales and what they mean to our planet on a spiritual level. Their lives are about to be put in danger again, as the Japanese whalers are on their way back to Antarctica, this time backed by $30 million in tsunami relief funds given to them by the Japanese government. But that’s not all the Japanese government is doing. 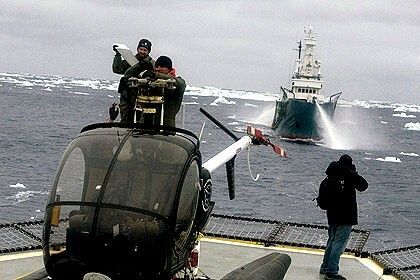 They are putting political pressure on Australia, and now the Australian government is denying the Visa of the U.S. helicopter pilot who’s needed to spot the Japanese whaling ships for the Sea Shepard society. Two years ago they did the same thing for two of the Sea Shepard’s captains before giving them the Visas two months later with no explanation. This is politics in its most ugly form. And the Australian government so far has refused to send an Australian ship to keep the peace, as it did last season—which will put the Sea Shepard ship crews in heightened danger. In the past one of the whaling ships even rammed and sank one of the Sea Shepard’s boats, although naturally they claimed the boat turned in front of them. A BP has to be benevolent for everyone connected with the prayer. On the practical side, you could donate to the Sea Shepard organization, which has to fund the ships and helicopters to find and stop the whalers, plus you could always write the Japanese Ambassador in whatever country you live in and demand they cease the slaughter of whales. And you could suggest to news organizations to cover the story. I know that Karin, who reads this newsletter already has contacted NBC and MNBC in the USA, but contact them and any news organizations you can think of. The Japanese government will not like the bad publicity they will receive over killing these wonderful sentient beings. Write to them or the Embassy in your country (just Google) with a strongly worded, but respectful protest. I addressed mine to the Honorable Japanese Ambassador Mr. Ichiro Fujisaki here in the United States. I‘m sure the Discovery Channel will again cover the Sea Shepard ships as they head for the Antarctic, so you can support the series by watching. And those who read this in Australia, you can play an important part in this. You must QUICKLY contact your local representatives to demand that the U.S. helicopter pilot, whose visa was denied, be immediately given one, and that an Australian ship be sent to keep the peace as it did last whaling season. If there are petitions being sent around, as there was two years ago, please sign or start one of your own. YOU CAN MAKE A DIFFERENCE! So everyone, GET CREATIVE! You can be “inspired” to come up with ways to make a difference that I have not thought of, such as starting a Facebook movement or other social networks you take part in (I just thought of that). Flo writes: Tom, thanks for letting us know that you’re finally getting some rain. When I started doing BPs for the Texas and surrounding areas, I asked for the whole of North America, not only for the droughts, but also for the other areas stressed due to flooding, fires, etc. Then I decided to expand this to cover all areas of this planet that are under stress, no matter what the stressors are. So I’ve been doing this twice a day for several weeks. Maybe others would also like to do this? Another way is to surround the earth with white light. I do this in my meditations each time and go continent by continent and include all the islands. Gaia says this works like a Benevolent Prayer too. Dianne in the UK writes: Hi Dear Tom or as Val and I always call you… ‘Lovely Tom Moore’. I just wanted to let you know that for several weeks now I have read in your newsletter exactly the MBO experience I need for my own personal circumstances – it is quite extraordinary. I tend to think this is not mere coincidence and I wonder if other people have experienced this? Another wonderful reason why I just could not live without MBO’s. So Thank You Once Again Lovely Tom Moore! Keisha writes: I had surgery on Nov. 30, everything went well and I am now home recuperating. I used the MBO’s you suggested and I’m sure they helped. Once again, thank you for your kindness and compassion. May you and your family have a wonderful holiday! Please let me know if you are ever in Michigan speaking I would love to meet you. I suggested to Keisha that she say something like, “I request a Most Benevolent Outcome for this operation, and may the results be even better than I can hope for or expect, thank you!” And I’ll be happy to come when some group sponsors me! Melanie writes on the forum: I find the concept of MBO’s to be really interesting. I hadn’t heard of them prior to reading this thread. At the time when I first tapped into this particular thread, I had a tooth that was really bothering me (read: absolute anguish!). So I did a verbal MBO about my tooth and I immediately – I mean, at that very moment! – felt the pain subside. So I did this regularly while I waited for the day when I could get in to the dentist and have the tooth pulled. The tooth still hurt but it seemed I could deaden it somewhat by asking for a benevolent outcome. I also did an MBO to ask that it healed quickly and the healing process has been smooth and without problems. Another MBO I tried led me to wonder, though, about how much these MBO’s might be self-fulfilling due to forming a positive attitude about the outcome requested. I found, for example, that if I was driving to rehearsal in another town (about 11 miles away), and I did an MBO requesting a good outcome for my drive, I would feel myself relax – literally, tense muscles in my neck and shoulders relaxing. That made me feel more comfortable overall, which made my drive more pleasant. And I wondered if the benevolent outcomes could, at least in good part, be created by our own selves and not a guardian angel or other ‘being’. In respect to public disclosure, I am not sure what I truly believe in. I can’t believe some of what I read on this forum, but I have a healthy curiousity and a fairly open mind. I’ve had enough unexplainable (by ‘normal’ standards) experiences in my life to know that there are things out there we don’t fully understand. I believe in energy within living things and within some non-living things, too, and that the energy can be useful if we choose to make it so. But I’m just not sure I believe in the guardian angel as it’s talked about in this forum. I lean more toward the side of “we are our OWN guardian angels and create our own positive outcomes”. I’m not trying to discredit anyone else’s beliefs! I see many people on here have varying beliefs on almost every topic and all of those people deserve respect for their beliefs. But I wonder if there are others who have similar beliefs as I do, regarding the self-fulfilling of an MBO request. Anyone? Melanie, I’ve been requesting MBO’s now going on 15 years. I had tried all the Law of Attraction type methods and found them lacking in results. When I first read in the Sedona Journal a channeled article by Robert Shapiro (he channeled Zoosh, a creator that assists our Creator) that you can request benevolent outcomes in your life, I was “inspired” to try it out myself. I had nothing to go on but I “knew” how to request MBO’s. They worked PERFECTLY even with no great energy put behind them. Yes you do get a positive feeling from requesting MBO’s. It comes not only from trust, but also I believe from the “good vibrations” sent to you by your own GA.
As I have mentioned several times on this thread, I didn’t know until years later that requesting MBO’s makes you more AWARE, raises your vibrational level, and as my GA Theo says, it’s the FIRST MAJOR STEP to cocreating with spirit–it takes you to another level. All I knew is that it worked PERFECTLY, and when it did not seem to, months or even a year or two later I would see why, as it was keeping me on my soul path. But of course as humans we have to analyze everything and question, question, question, which is what you’re doing now. All the great religions mention angels by one name or another. You can Google guardian angels in the Bible (mentioned as an example in Matthew), and yesterday I looked up a passage in the Quran for a FB friend. It’s 86:4 and you can Google that too. In Judism, on the eve of Shabbat or before Friday evening dinner it is customary to greet ones Guardian Angels or Angels of Service. In the Hindu religion they believe all devine beings are assigned jobs such as a guardian. Perhaps your next step is to try meditation and connect with your own Guardian Angel and ask questions. I do encourage everyone to go into this light alpha meditative state and ask questions, just as I do and either write or type them on a computer as I do–as I can’t remember even 10% of what I received upon coming back to the normal beta level. I look forward to hearing of your progress! FlyingLight on the forum writes: All over the world, there are millions of people who everyday pray, but most pf them don’t get results. In which way MBO is different? It’s also a prayer so why should the GA hear more “clearly” MBO than another prayers? My GA Theo told me that this is the FIRST MAJOR STEP (yes I’m repeating) in cocreating with spirit. And it’s something so simple that ANYONE can do, no matter whether they are just being introduced to spiritual concepts, or someone who has spent the last 30 or 40 years reading everything they can get their hands on and have experimented with all sorts of modalities. So you may request a MBO to win the lottery, but that probably is not on your soul contract; the benevolent outcome will be the person who has a soul contract to experience sudden great wealth wins, and then has to learn how to handle this. This is the same “template” as for the person who inherits great wealth, finds a vein of gold, etc. And note how simple these requests are. There are no deities mentioned, so it allows everyone to use these requests, and if they believe the request is going to God, Allah, Vishnu, Jesus, Mohammad, or a Guardian Angel as I believe, that’s OK. I think I was “inspired” to word it that way.